Racegoers at this week’s Cheltenham Festival have become the first people in Britain to use app-based mobile tickets for general admission to a sports event, after The Jockey Club launched the feature as part of its new ‘Race On’ app. The Race On app has been developed to enhance the customer experience at the 348 racedays The Jockey Club stages annually across its 15 racecourse venues nationwide, which welcome nearly two million spectators each year, as well as for those people following the races from off-course. As well as offering mobile tickets to those purchasing general admission and with an easy share option to send on to members of their party, the app also offers a series of other features. These include a live race card, instant results, competitions to play against fellow racegoers – including a five horse selector to engage people in the sport, maps of facilities and ‘Golden Moments’ that provide prizes including visits to the parade ring to see the horses up close and even presenting trophies on some racedays. It is now freely available to download for Apple and Android devices. In addition to The Cheltenham Festival, which welcomes more than 250,000 people over four days this week, other events staged by The Jockey Club include the Randox Health Grand National Festival, The Investec Derby Festival, the QIPCO Guineas Festival and the Moët & Chandon July Festival. 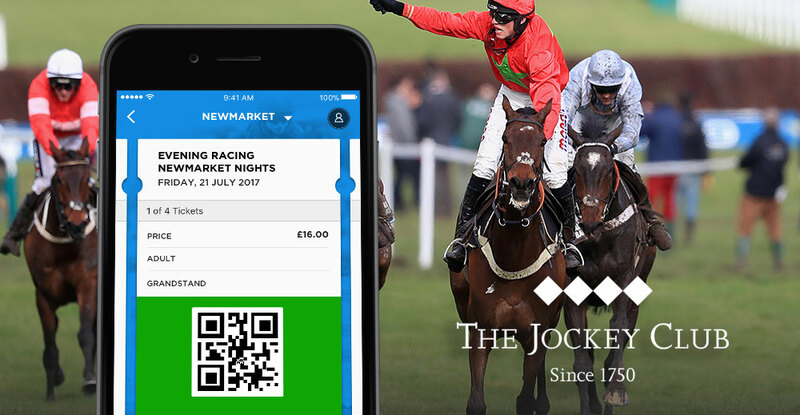 The Jockey Club took the decision to offer mobile tickets following extensive trials. Many Britons already use app-based tickets for the likes of air travel, for example, while in sport a number of US stadia have introduced the practice. Other types of mobile tickets, including as PDFs sent by email or text, have been used to access various UK events. Paul Fisher, Chief Executive of Jockey Club Racecourses, said “So much of what we do is about listening to how we can make a person’s raceday experience even better and we’re constantly innovating to do so. “I’m very proud The Jockey Club has achieved another first in sport by introducing mobile ticketing through our app, along with its many other launch features, from at-a-glance runners and riders information to competitions to play with your friends or family and against other racegoers. The mobile app has been developed in partnership with leading fan technology firm, Monterosa, which has created apps for ITV’s Love Island, X-Factor, The Voice, ITV Racing and I’m a Celebrity Get Me Out of Here, as well as for Team GB and Visa for the 2018 Olympic Winter Games; adidas; BBC; EA Sports; NFL; Sky and World Rugby. Mobile tickets will be available through the Race On app for all of The Jockey Club events for customers purchasing tickets that do not require a ‘swing badge’. The Jockey Club recognises the popularity of swing badges and the role they play in providing access to different facilities at racecourses. Therefore swing badges will continue to be delivered to customers in the normal way. The Jockey Club’s racecourses are Aintree, Carlisle, Cheltenham, Epsom Downs, Exeter, Haydock Park, Huntingdon, Kempton Park, Market Rasen, Newmarket July Course, Newmarket Rowley Mile, Nottingham, Sandown Park, Warwick and Wincanton.